What are hopper windows? Many people are confused by what these really are and how they work, due to their similarity with other styles and window types. If you are part of that group, read on to find out all about hopper replacement windows, including the pros and cons of using them in your home. How Do Hopper Windows Work? A hopper window has hinges at the bottom of the window and opens by tilting out at the top. They can be fully opened and the screen is attached on the outside of the pane/frame. A crank-style handle, similar to those found on casements, is situated at the inside bottom and is turned to open and close it. There is also a support that keeps the pane in place once opened so it does not slam shut during a gust of wind. Awnings and casements are similar in function to the hopper. All three types are hinged along one side and then open up from the other side. The difference is that hopper windows are hinged on the bottom and open from the top, awning windows are hinged from the top and open from the bottom, and casement windows are hinged from the side and open from the other side. Transom window is another term you may hear, and refers to a hopper, awning or fixed pane window that is positioned over another type of window or door. They are often used in small spaces that require a lot of ventilation. Since they open completely, they offer as much ventilation as possible in a compact space. Most often, hopper windows are used in small bathrooms and basements. They are also found above doors and other types of windows and are then referred to as transoms. 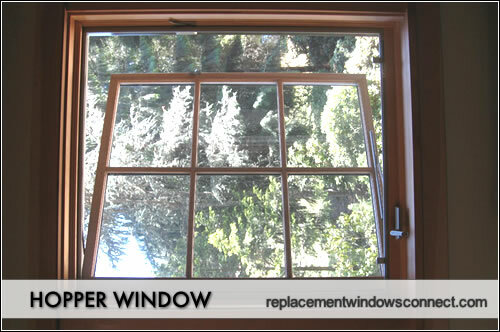 They are more energy efficient than many other window types due to their tight seals. They contain compression seals along three sides of the window, which prevent air leakage more effectively than sliding or double-hung replacement windows for example. They can prevent about twice as much air leakage than the sliding or double hung. Because hopper windows have a hinged design that allows the window to open fully, the windows allow maximum ventilation in a compact space. The crank handles are situated along the bottom of the window and are easy to turn. No reaching or straining required. It is difficult to cover hopper windows with blinds or other treatments because of the way the windows open and close. This can reduce privacy, although tinting and privacy films can be used to block the view from outside. Hopper windows should not be used in the rain. Unlike awning windows, which open from above and are a great option for ventilation even during the rain, hoppers open from the bottom and can funnel water right into the house if left open when the rain starts to fall. Hopper windows are often used in basements and are therefore situated near the ground. This makes them an entry target for would-be intruders. Unfortunately, the locking mechanism is situated at the top of the window, where they open, and may be difficult to close if the window is placed high up on the wall, like it typically is in a basement. However, there are additional locking devices that can be used to better secure the windows.